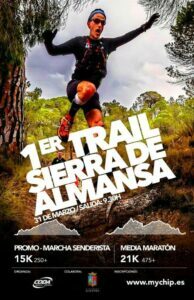 POR MOTIVOS DE SEGURIDAD SE HA APLAZADO EL I TRAIL SIERRA DE ALMANSA PARA EL PRÓXIMO 6 DE ABRIL. 9:30 H. I TRAIL MONTAÑA (ORGANIZA CODA). SALIDA Y LLEGADA DESDE FINCA MADRÚGALO.